Creo Parametric is nothing but the next version of Pro/ENGINEER Wildfire. So there is not a great deal to explain there. Creo Direct is Creo Parametric wearing a different suit, that’s all. If you are interested in a technical explanation of the preceding statement click the image below to enlarge it. Or you can take my word for it and skip to the next part of this series. So basically Creo Parametric and Creo Direct are two Pro/ENGINEER programs installed and running on a computer. 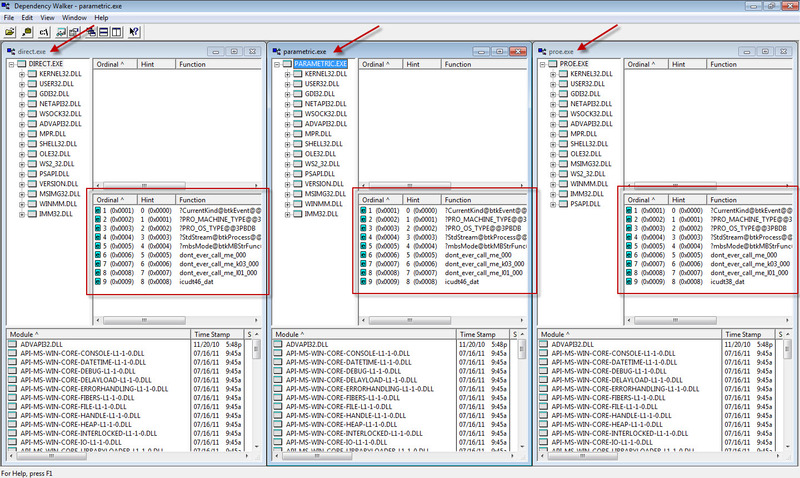 This can be seen by taking a closer look at the Creo 1.0 installation folder. Obviously there is no point to literally have two copies of Pro/ENGINEER. So PTC has put the files common to both programs in the “Common Files” folder and created a folder each for Creo Parametric and Creo Direct. The size of the “Common Files” folder is 3.4 GB. Whereas the size of the “Direct” and “Parametric” folders are about 100MB each with almost identical sub-folder structures and contents. So that should give you a good idea of how much is common between both the programs – a lot. So when PTC says that all CoCreate users would one day migrate to Creo Direct, they are actually saying that all CoCreate users will one day be working on the Pro/ENGINEER (now Creo) platform. Looking at the way things have panned out I get the feeling that PTC acquired CoCreate more for its customer base and less for its software because they are going to more or less do away with it sooner or later.